Unfinished columns with one, two or more brides can significantly vary the pattern. Very often you need to combine them in bundles to group columns. 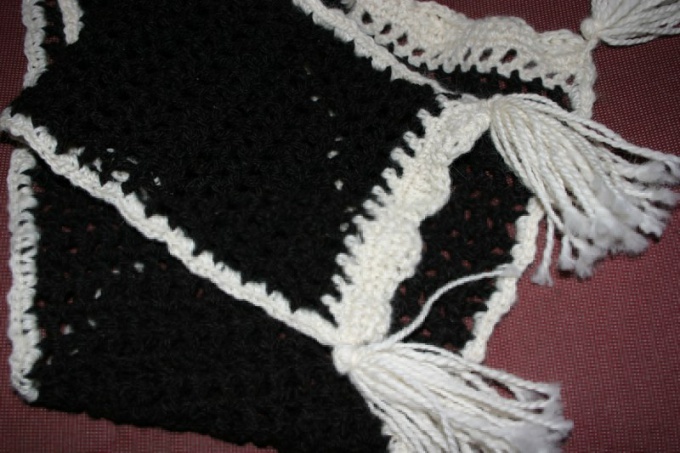 If unfinished posts to finish the parts, then connect them to each other will be a back seam "loop in the loop" as when knitting. - 2 hooks connected by a line. Link the sample. For training make a chain of an arbitrary number of loops. Unfinished columns with nakida can be part of a circular motif, but first, try to communicate with them direct canvas. Make 2 hanging loops on the rise. Throw the thread on the hook like you do when knitting conventional columns with nakida. Enter the hook in the right loop of the chain. Move the hook under the working strand, grab her and pull outward On the hook you should have three loops — the one you just pulled, yo and the one that was already on the hook. Again, grab the working thread and pull it through the loop, folded from the air loop or column of the previous row and yo. For knitting conventional column with nakida you would need to purl two together are on the hook loop. Now don't do it, leave both. Analogichnaya following incomplete column with nakida. Bars with two, three or more yo tally almost the same. Promazyvaya first receptions as well as for regular columns, but do not finish and leave on hook 2 loops. After you complete the following unfinished column should be formed 3 loops and so on. The patterns in the middle part, such columns rarely performed outside of a combination with other elements. Usually, they must happen to interconnect to form a beam. Tie in the described way several unfinished column with one or more yo. After vyvazhivanija latest grab hook working thread and pull it through all loops, except the last one, that is, one that has already been before vyazaniem the first column. You have 2 loops. Provarite them together. There may be other combinations of groups of columns with nakida. This is usually indicated in the description of the picture. For example, proverite 5 such columns. Then grab the thread, pull it through the first 3 column. Turn the work, tie a series of loops. Guide the hook through all the unfinished posts and pull them through the loop. Tie it together with the end loop of the air chain. In General, the ability to knit different options of columns allows any master to invent new and new drawings. This technique may be appropriate at the conclusion of the detail. Provarite such columns in the last row. The end items in this case is roughly the same as when knitting. The thing to do is hook on the fishing line or even two hooks connected by a line with each other in the manner of circular needles. You can remove the loop and on the secondary thread, and the knitting parts of a small size pin. Tie the second part, ending it in exactly the same way. Connect the fragments with each other knit stitch "loop the loop". It can be carried as a hook, and a needle.